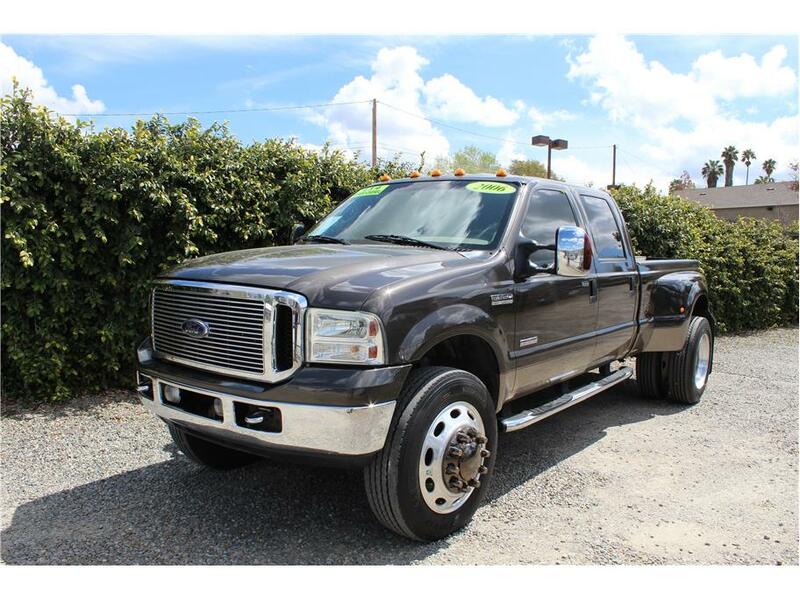 Home > > Vehicles > 88267 > 2006 Ford F350 Super Duty Crew Cab Dually SOLD!!! This 2006 4×4 Ford F-350 Lariat long bed has a turbo diesel 6.0L V8 engine with an automatic transmission and only 88k original miles. Our Ford has great aftermarket upgrades like a Sinister diesel coolant bypass, Sinister Coolant filter, 57 gallon fuel tank, rear air bags which help when you are towing, 5th wheel rails in bed, tool box, EDGE scanner, Alcoa wheels wrapped in Toyo M122 Regroovable 22.5 tires, tinted windows, and a JVC head unit with Bluetooth! The FX4 has factory features don’t fall short like leather seats, front heated and power seats, rear parking sensors, tow package, tubular side steps, power windows, power door locks, and the great looking Lariat wood grain accents through out the interior. This Ford just went through a complete 151 point inspection by a Licensed California repair shop and received Four brand new rear Toyo tires, replaced the Alternator, Air filter, Fuel filter, Turbo, Fan clutch, New wipers, New Steering Stabilizer, and a fresh oil change service. This Ford is ready to tow its next load with ease. Come test drive it today!